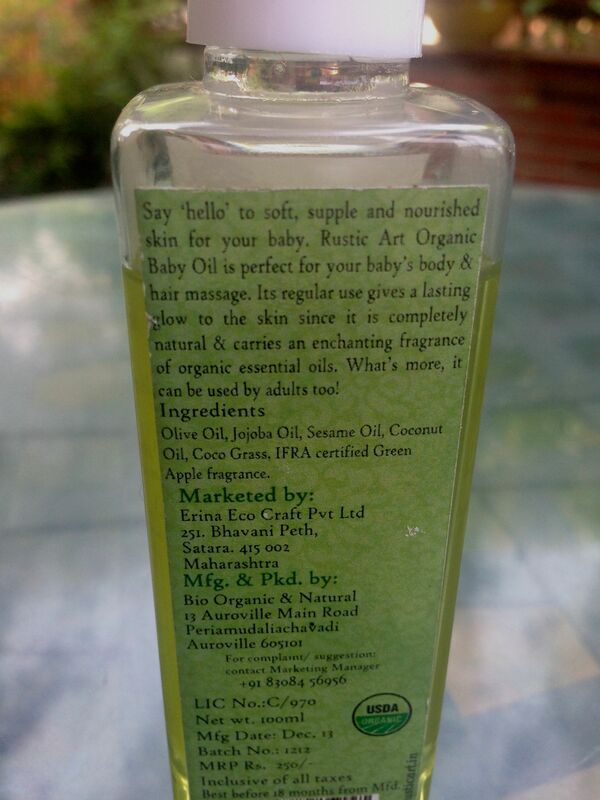 The official website of a leading brand synonymous with all things pink & blue and cooing-gurgling babies looked on most lovingly by their doting mums, lists ‘Mineral Oil’ & ‘Fragrance’ as the main ingredients in its baby oil.In fact , these are the only 2 ingredients mentioned. They certainly don’t believe in being as clear & transparent as the oil they market. Point is , am I missing something here? Because ‘Mineral Oil is any of the various colorless, odorless, light mixtures of Alkanes from a non-vegetable (mineral) source, particularly a distillate of petroleum. Baby Oil refers to perfumed mineral oil.’ (Source: Wikipedia), while most of the commercial ‘Fragrance’ is a shrouded-in-mystery blend of synthetic, chemical components. 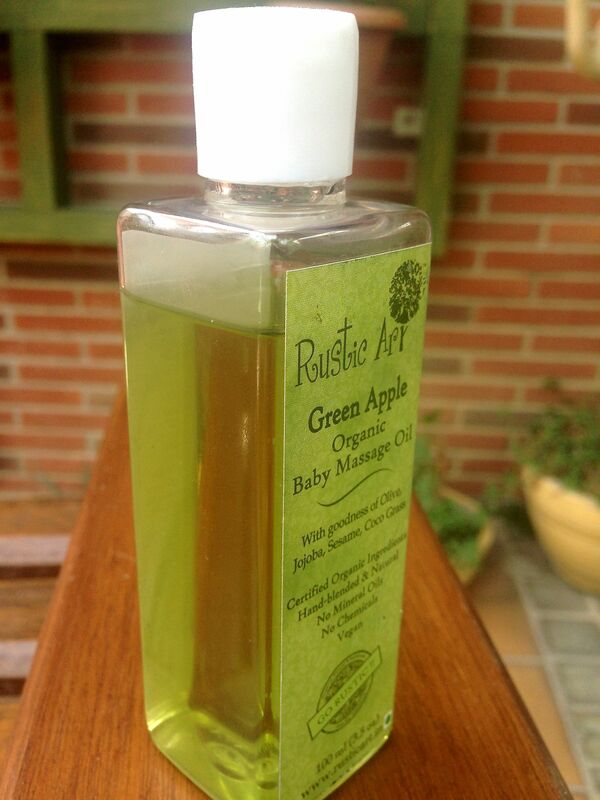 Babies are being slathered and massaged and rubbed with this chemical cocktail every day in many homes. It’s beyond commonsense about why would someone manufacture and market such obviously unhealthy concoctions and that too for babies! Of course, there are many women who use baby oil as makeup remover and massages etc. 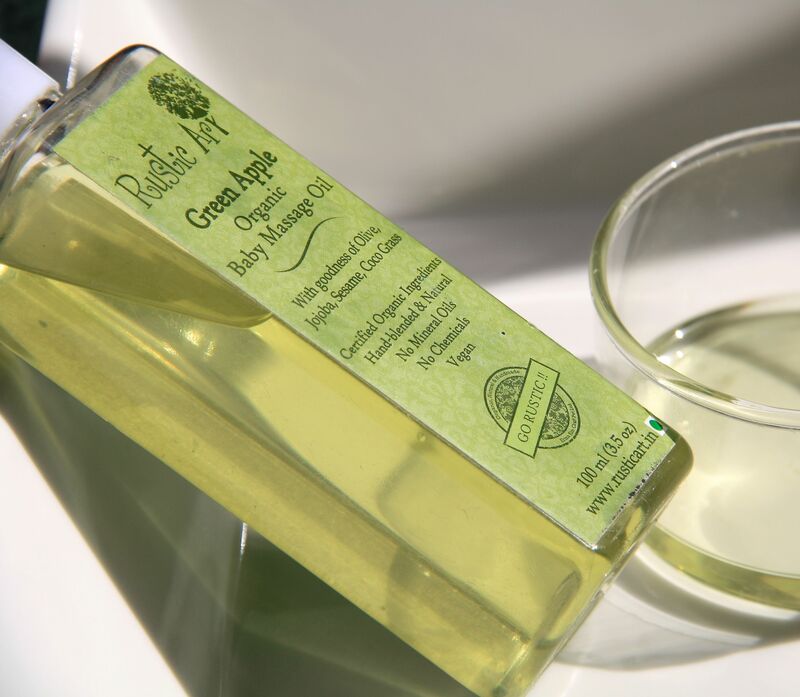 You might want to read up on what Vimala McClure, the ‘Mother of Baby Massage’ and founder of the first International Association for Infant Massage, has to say about oils and infant massage. These li’l munchkins are best off with non-toxic, chemical & synthetic fragrance free , natural, plant-based oils – Coconut, Olive, Almond and others. 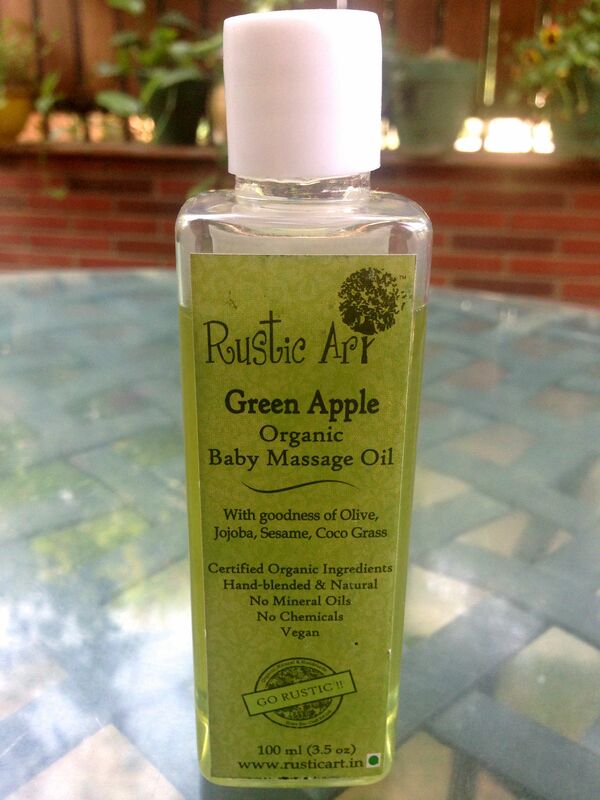 And if you want to go a step further with pure, organic branded options take a dekko at this review of Rustic Art’s Green Apple Organic Baby Massage Oil. Packaging The oil comes in a 100 ml bottle , which is also convenient to carry on travels. In fact, it can easily fit into your handbag without taking much space .Just make sure you have the cap screwed on tightly, though it has a small plastic plug-in cap to make sure the product doesn’t leak! The product label carries the message of ‘Certified Organic Ingredients, Hand blended & Natural, No Mineral Oils, No Chemicals, Vegan’. Product Experience The product was in a semi solid state when I received it, which the brand clarified was because of pure Coconut Oil as ingredient. 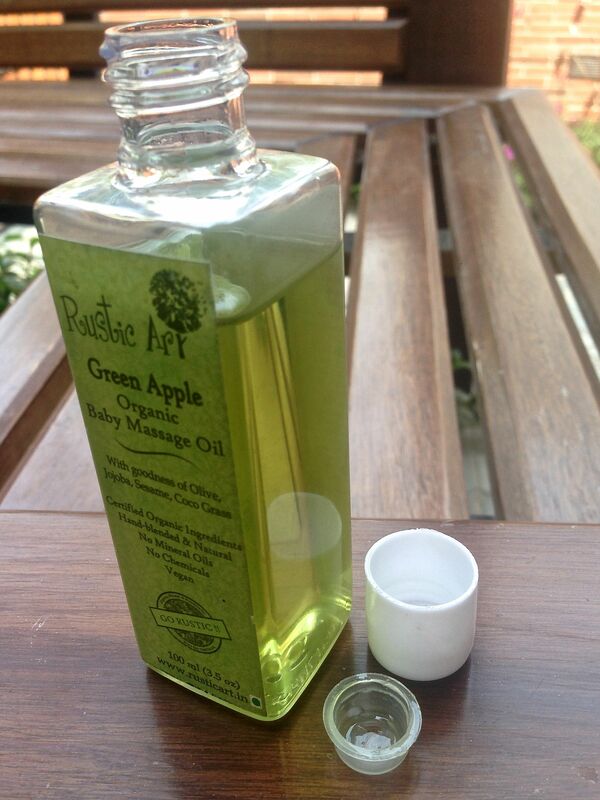 On keeping the bottle in a mug with warm water, it melted into a clear oil consistency. 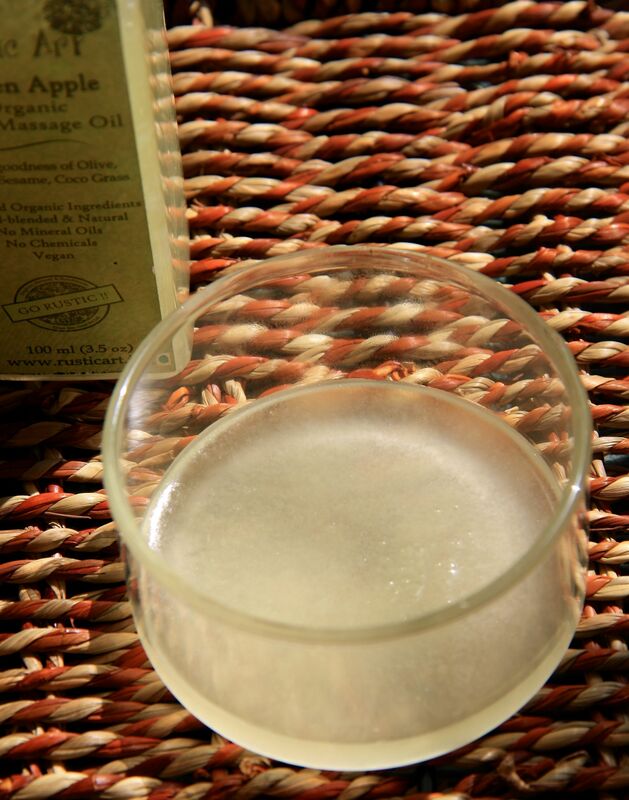 Now, with the rise in temperatures the product is not solidifying and maintains its liquid state & consistency. Would I recommend it? Absolutely! Nothing but the best of natural products for our lush babies! Status : Product will be back in stock soon. Next PostPrep for your first 5K/10K with Tanuja Sodhi!